For real estate agents, lead nurturing is all about building a relationship with prospects. One of the most effective ways to do this is by providing prospective clients with useful, relevant information that helps them through the buying/selling process. For Sale Marketing’s real estate content creation services provide a full array of content marketing materials to help real estate professionals attract leads, keep them engaged, and nurture them throughout the weeks, months (and occasionally years!) of their entire sales journey. Real estate marketing has such a long sales cycle that many realtors find themselves struggling to keep from losing prospects’ attention before they convert. Typical home buyers search for 10 weeks before purchasing a home, according to NAR’s 2014 Profile of Home Buyers and Sellers. While that is the standard purchasing process, realtors often experience delays of as much as 3 years between the time when contacts first registered on their website and when they were ready to move forward on a property sale. This extended lead time gives you plenty of time to introduce clients to all the services your real estate agency can provide, but it also increases the likelihood that other realtors will step in and divert your leads. That’s where content marketing comes into play. Nurturing your leads using real estate content works – when you provide prospects with the appropriate content for each stage of the sales funnel, you can keep real estate leads engaged and hold their interest all the way through their property purchase. This helps ensure that your real estate prospects turn to you, not your competitors, when they are finally ready to purchase or sell their home. For Sale Marketing can help you position yourself as the go-to real estate authority by providing a wide range of content that conveys information on local neighborhoods, properties, buyer and seller issues, real estate concerns, and more. Our skilled content creators can help you implement the full array of real estate content marketing strategies. An interesting, informative blog is the ideal place to begin nurturing your real estate leads. 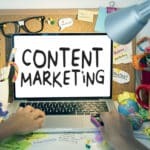 Our professional real estate blog writers present information in a personable, relatable way, generating one to two blogs per week to keep an active real estate content marketing strategy in place. We can even help you set yourself apart as the local authority with features that focus on local amenities and neighborhoods. Our SEO-savvy blog writers know how to incorporate keywords, long tail phrases, and verbal query phrases in the optimum density and in a natural manner that never seems forced. We’ll add in custom Meta descriptions, ALT tags on images, and more to up your SEO value. This ensures each blog delivers peak SEO performance to drive your site to the front page of search engine rankings. We’ll follow that up with detailed SEO analysis to keep your content tightly targeted so it consistently provides positive search engine results. An email newsletter is an easy way to nurture your real estate leads. For Sale Marketing provides full email newsletter support as part of our real estate content marketing services. We can create short, informative articles, how-to guides, and useful information, producing several versions of each monthly newsletter to keep each segment of your subscriber list interested. We’ll add in some attractive, eye-catching photos, and finish up by making sure your email content is optimized for mobile so your subscribers can view it on smartphones and tablets with ease. Custom landing pages to drive engagement rounds out our content offerings for your email marketing strategy. Social marketing posts are the perfect way to build engagement with your real estate leads. Our content creators can produce and post messages for real estate agents and agencies on Facebook, Twitter, Google+, and the full range of social media marketing strategies. We will create a careful mix of real estate relevant issues and social strategies to engage your clients without overwhelming them with off-putting marketing messages, incorporating video marketing and hashtags to boost your marketing reach. Real estate videos are increasingly in demand, not only by Millennials but also across the wider body of real estate clients, who find them an appealing method of absorbing knowledge. Our videographers can create video series that address topics of interest to home buyers and sellers, such as selling tips, home renovation how-to guides, financing sources, etc. We can create a dedicated YouTube channel for your videos; periodic releases of these real estate videos is another method of dissemination that provides you with a convenient, natural way to nurture your relationships with real estate clients. As an added bonus, exposure to your on-screen presence fosters a sense of familiarity and trust that will benefit you when clients are finally ready to purchase their home. Our staff can also produce short, 3-to 10-second videos that you can incorporate into your Facebook posts and Tweets to super-charge your real estate social marketing strategies. Prospective clients want to know that you are consistently signing prospects and closing sales. We can help you showcase your listings by regularly posting announcements for Open Houses, New Listings, Just Sold, etc. Informative gated resources can help real estate agents nurture and grow their relationships with clients. As long as you keep adding to your online library with resources that provide true value to your real estate leads, they will continue to give you deeper insights into what they want as they move down the purchase path. For Sale Marketing can provide additional content creation services to help you develop a significant body of real estate content that includes e-books, infographics, white papers, downloadable checklists, and more. In addition to building your email subscriber list, your large library of real estate content will aid your marketing efforts by establishing you as the go-to resource for real estate knowledge. We can provide you with digital versions as well as printed materials to hand out to your clients in person. For Sale Marketing is here to help you extend your marketing reach with a full range of professional content creation services including real estate blog writing services, social media marketing services, branding packages, and much more. Talk to us to find out more ways our real estate content creation services can help to build your marketing reach.